The 35th Infantry Regiment Association salutes our fallen brother, SGT Thomas David Campbell, who died in the service of his country on May 29th, 1966 in Pleiku Province, Vietnam. The cause of death was listed as Small Arms/AW. At the time of his death Thomas was 24 years of age. He was from Thomasville, Georgia. Thomas is honored on the Vietnam Veterans Memorial at Panel 07E, Line 116. The decorations earned by SGT Thomas David Campbell include: the Combat Infantryman Badge, the Bronze Star, the Purple Heart, the National Defense Service Medal, the Vietnam Service Medal, the Vietnam Campaign Medal and the Vietnam Cross of Gallantry with Palm Unit Citation. Thomas graduated from Magnolia High School, Thomasville, GA. His parents were Me and Mrs Thomasl L Campbell of Thomasville. 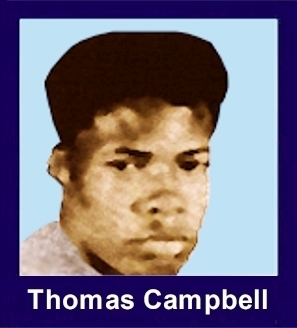 Thomas had four sisters: Ruth Virginia, Marilyn Lois, Shirley Jean, and Debra Anita; and three brothers: John Andrew, Calvin, and Richard Campbell; all of Thomasville.